The USBMA adapter is designed for desktop PCs, and converts Mini-Cards to a USB port. You can insert your USB-type minicard (such as HSPA-3.5G), GPS, 802.11a/b/g to this adapter, and then plug it to a USB port through a USB cable. A Standard SIM card connector is provided. 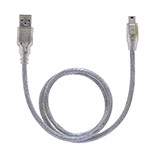 USB mini type-B connection to desktop or notebook PC. 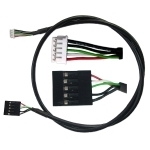 Supports two primary system bus interface: USB. Supports USB interface of Mini-Cards such as 3G,CDMA, WLAN,WWLAN, HSPA MODEM , GPS, WiMAX Mini Card to desktop PC. Supports U.FL/IPX to RP-SMA pigtail Wifi RF cable adapter. PCI Express Mini Card to USB adapter. SIM Connector for CDMA HSDPA/HSUPA, UMTS, EDGE. USBMA is a USB passive adapter. It will only support a wireless USB minicard. This cannot support PCIe minicard. 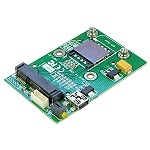 Click the button below to add the USBMA Module V1.2 (Wireless USB Mini Card Adapter) to your wish list.